ClubCoins Nødvendigt: 880 Please note that, for now, you cannot download content from our platform directly onto a mobile device (phone, iPod, iPad, tablets...). You need to download your items onto a PC or Mac, and then transfer them onto your device in the normal way. We are working on allowing direct downloads to mobile devices but this is not possible in the current version of the platform. Sorry about the inconvenience! 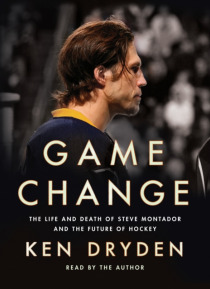 Shortlisted for the BC National Award for Canadian Non-FictionA Globe and Mail Best Book From the bestselling author and Hall of Famer Ken Dryden, this is the story of NHLer Steve Montadorwho was diagnosed with CTE after his death in 2015the remarkable evolution of hockey itself, and a passionate prescriptive to counter its greatest risk in the future: head injuries. Ken Dryden's The Game is ackn… owledged as the best book about hockey, and one of the best books about sports ever written. Then came Home Game (with Roy MacGregor), also a major TV-series, in which he explored hockey's significance and what it means to Canada and Canadians. Now, in his most powerful and important book yet, Game Change, Ken Dryden tells the riveting story of one player's life, examines the intersection between science and sport, and expertly documents the progression of the game of hockeywhere it began, how it got to where it is, where it can go from here and, just as exciting to play and watch, how it can get there.